The LNA Air Force claims that it has bombed Chadian opposition militias in southern Libya (Photo: archives from Pro HoR LANA). 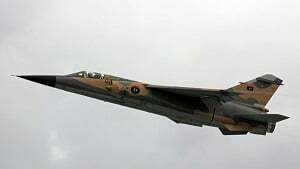 Libyan National Army (LNA) Mig-24 fighter jets carried out an airstrike in the south of the country targeting a checkpoint run by the Chadian opposition militia the Counceil de Comandament Militair Pour le Salut de la Répunlique (CCMSR) on Sunday in Tmassah village, 161 kms south-east of Sebha. No details on casualties or damage were provided by the LNA. In a separate earlier incident on Sunday LNA airstrikes targeted positions of what the LNA alleged were hostile Chadian militias near Torbou (A key illegal migration passage) located between Um Aranib and Zueila village, where a makeshift palm hideout used by foreign militias was targeted. It will be recalled that the CCMSR opposition militia group itself splintered from another Chadian opposition militia group, the Le Front pour l’alternance et la concorde au Tchad (FACT). FACT itself has been involved in the fighting in Libya. FACT had been targeted in its makeshift barracks in Doualki near Sebha on 14 April 2016. The heavy presence of mercenary foreign militias in southern Libya is a direct result of the Libyan political split between Tripoli and Tobruk, with each side recruiting militias to support its fighting effort. The involvement of mercenary foreign militias has been blamed for the rise in crime rates, human trafficking and the drug trade to subsidize the war effort. The UN Libya Experts Panel report blamed foreign interference in Libya for the failure of the two Libyan sides to achieve reconciliation that is being mediated by the UN. It will be recalled that the Presidency Council (PC) formed Ceasefire Committee arrived in Sebha from Tripoli on Wednesday and commenced peace talks between the warring Tebus and Awlad Sulieman tribes. LNA forces started arriving at the Tamenhint and Brak Al Shatti airbases Friday morning with military logistics and armoured vehicles as part of the LNA’s “Law enforcement” operation in reaction to the ongoing fighting in the south of Libya.